I will be presenting a slide lecture, “Feminizing Fabric Formwork,” this Friday, November 6, 2015 at 9:00 a.m. at the NSCAD Port Campus in Halifax. 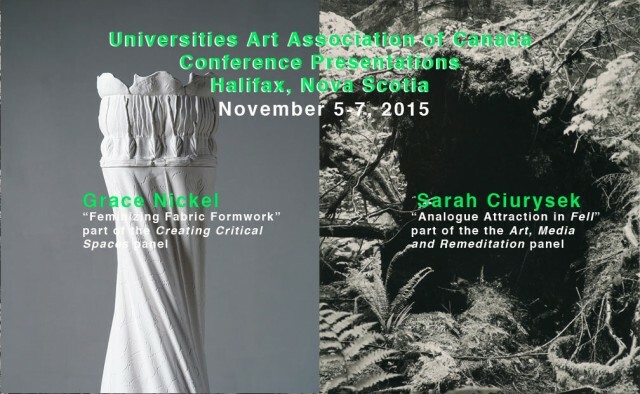 My talk will be part of the Creating Critical Spaces panel of the UAAC Conference 2015, November 5 to 7. Sarah Ciurysek will also represent the University of Manitoba School of Art at the Art, Media, and Remediation panel, Friday afternoon at two o’clock. In the past few years I have been involved in a period of intensive research, exploring new technologies both at home and in China. In 2012, I had the opportunity to work at the Centre for Architectural Structures and Technology, CAST, at the University of Manitoba, learning the fabric-formwork technique that the researchers in the Faculty of Architecture invented and were continuing to develop. Informed by traditional wooden formwork, they stretch fabric membranes on wooden frames and create large concrete forms that look soft, but are not. Although the structures appear organic, they remain stark, unadorned, devoid of ornament. The tenets of Modernism remain alive and well at CAST. Once comfortable with the new technology, I appropriated their methods (with their encouragement and blessing) and applied them to porcelain, with the goal of feminizing and embellishing the fabric formwork process. I selected highly decorative textiles and made fabric models for my moulds that sported raised floral prints, fine textures, embossed stitching, and intricate, lacy patterns. I stretched these textiles, mostly Chinese commercial drapery fabrics, onto wooden frames, and then made plaster moulds from the fabric models. Finally, porcelain was cast in the plaster moulds, resulting in finished large-scale sculptures, to be exhibited in a gallery or other public space. My white porcelain forms have an architectural scale and may initially appear austere, but upon closer inspection, their detail becomes evident. My installations provide a substitute for what was once considered a social imperative offered by public architecture – a peaceful, contemplative space for public and private reflection, restful and quiet, yet strong and awe-inspiring. It’s the detail that invites the viewer into an intimate dialogue with my work, to find comfort in the textile patterns and organic motifs of my craft, my art, my architecture.